Ants can be quite destructive to lawns once their numbers begin to get out of control and in plague proportions. Their damage can then transfer to paving and other areas around the home. While many attempts are often made to kill ants with little success, it can be achieved by utilising a few different methods. Ants prefer lawns which are in poor health, which is sparse or patchy in areas. Lawns in this condition become a perfect environment for ants to thrive and flourish. Therefore, the first step in controlling ants is to increase the health and vitality of the lawn itself. A healthy lawn, with a nice healthy thatch layer and plenty of green leaf, is not a welcoming environment for ants, so as a first step learn about some of the basics of lawn care and aim to increase the health of the lawn. This will always start with the basics of regular fertilising and wetting agents, regular mowing to promote more spreading of the lawn runners, decreasing shade where required and a good watering routine. Several methods can be combined to kill ants. The first is to go straight to the ants’ nests and break them open with a stick, once the nest is opened an Ant Dust can be put directly down the nest. This should be done with all nests. Ants will survive and repopulate new nests however, so the next method is to use a liquid Ant Poison. This type of poison is then baited in small quantities at all locations around the property where ants are most active. The ants then take this liquid poison back to their nests, killing even more ants than would be achieved by other methods. 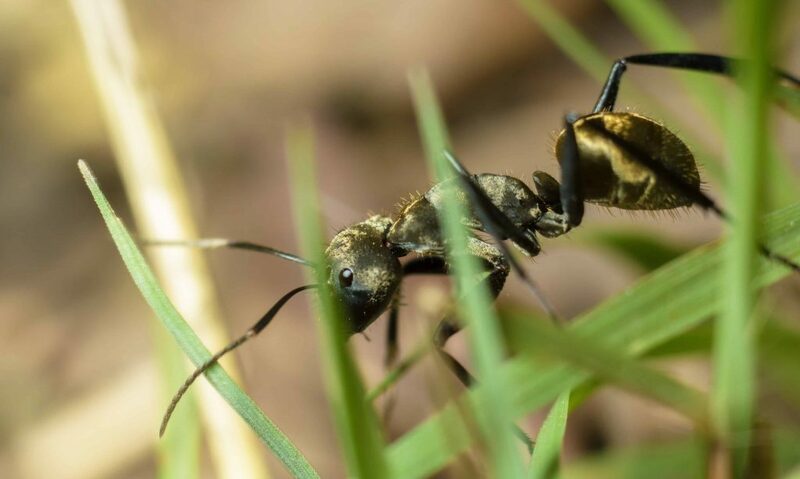 To control ants in the lawn we must also control their entire environment around our properties, otherwise we’ll continue battling ants until our dying days! With this in mind, we must control and remove ants wherever they are found on the property. Paving is a favourite home for ants. There is often a sandy base which is perfect for ant nests, easy access in and out between the cracks in the pavers, few predators can reach them and the pavers insulate the nests from heat and cold. Even worse, is that after several years of ants under paving, the paving can become uneven due to all the sand being removed. So let’s make this welcoming environment a little less welcoming for the ants. If an infestation is in paving the first step can be to buy some ant control powder and generously mix it with some fine white sand. This mixture is then poured over the paving and swept into all the cracks to fill them up. This is the best method, because using sticky liquid ant killers can be very unsuitable for areas which are frequently walked on. This should kill all ants under paving, the liquid ant killer can also be used simultaneously in nearby areas. Once the ants are removed from the paving completely, there is one last ant deterrent which can be used. This involves mixing some white cement with some white sand in very low ratios – perhaps 10 parts sand to 1 part cement. This dry mixture is then poured over the pavers and swept into the cracks. Over time this mixture will harden without adversely affecting the pavers, making your outdoor area a lot less welcoming for ants to ever establish again.